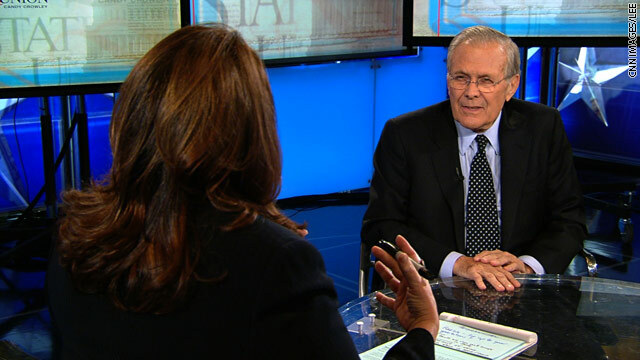 Washington (CNN) - If the Bush Administration had known there were no weapons of mass destruction in Iraq, it probably wouldn't have decided to invade in 2003, former Defense Secretary Donald Rumsfeld said in an interview broadcast Sunday. However, intelligence reports - now shown to have been false - that Iraq possessed so-called WMDs was the main reason for going in, Rumsfeld said. "No question it was the big one," he said. Asked if the United States would not have invaded if the administration didn't believe Iraq had the weapons of mass destruction, Rumsfeld said: "I think that's probably right." He criticized the source known as "Curveball" - an Iraqi defector who admitted his claims that Iraq possessed WMDs were false - but stopped short of condemning the U.S. intelligence community. Now peddling a book four years after being replaced by Robert Gates as defense secretary following heavy Republican losses in the 2006 mid-term elections, Rumsfeld maintained the swagger and bravado that were his hallmarks when dealing with the media as a Cabinet member. "They now have switched from the campaign mode, and they are keeping Guantanamo Bay. They are keeping indefinite detention," Rumsfeld said. "They are keeping military commissions. So obviously, they've come to the conclusion that their campaign promises - easier to campaign than it is to govern." "Well, he had not accomplished a thing when he got the Nobel Prize," Rumsfeld said. "It was given to him on hope. Had to have been because there wasn't anything that he'd done." He said he was "deeply worried about the budget" and that the country needs to start saving money now. Some of those savings can come in the Pentagon budget he formerly oversaw. Saddam was a murder of thousands who took Iraq not by an election, vote of the people but by force and murder. Saddam was a criminal who should have been jailed long ago by the Iraqi people, unfortunately, the Iraqi people couldn't go up against Saddam's military forces and the local authorities. As for President Bush being misinformed by the CIA and others on weapons of mass destruction, it happened to President Obama as he was misinformed also on Egypt by the CIA and other divisions and Pelosi claimed she had also been misinformed on weapons of mass destruction by the CIA and other divisions. seems we forgot the reason that President Bush wanted to get Sadamm because he threaten to take out his Daddy. That cost us thousands of American lives too. People like Rumsfeld and Cheney really need to sit down and shut up and be thankful President Obama has chosen the high road NOT to persue possible war crime charges against them. This even angered some of is base on the left for not doing so. Don't Buy Books By CROOKS!! If Rumsfeld thinks he's so right why doesn't he go answer for his war crimes. I'm sure that all of the families and friends of the people he had killed and tortured believe that he should be proud of what he did and think better of the US because of it. How many deathes would not have made it worthwhile? Two millio? Ten million? All of the Iraqies left in the country? Should as many said kill them all and let god sort it out?